dineoncampus.ca is the information hub for all of your dining needs! You will find contact information, menus, hours of operation and upcoming event details. Can't find something? Need to send along a great idea? Need more information on a topic? We would love to hear from you! Put your fresh fork forward! From intimate gatherings to large banquets, our dedicated team is at your service. Our menu will soon be available to view online. Please contact us for further details. Real Food. Real Fresh. Real Chefs. We are excited to bring On the Go Quick Cuisine to the Waterfront, Institute of Technology, Kingstec and Truro campuses of Nova Scotia Community College. Visit our cafes for a selection of sandwiches, wraps, salads, break boxes and snacks. 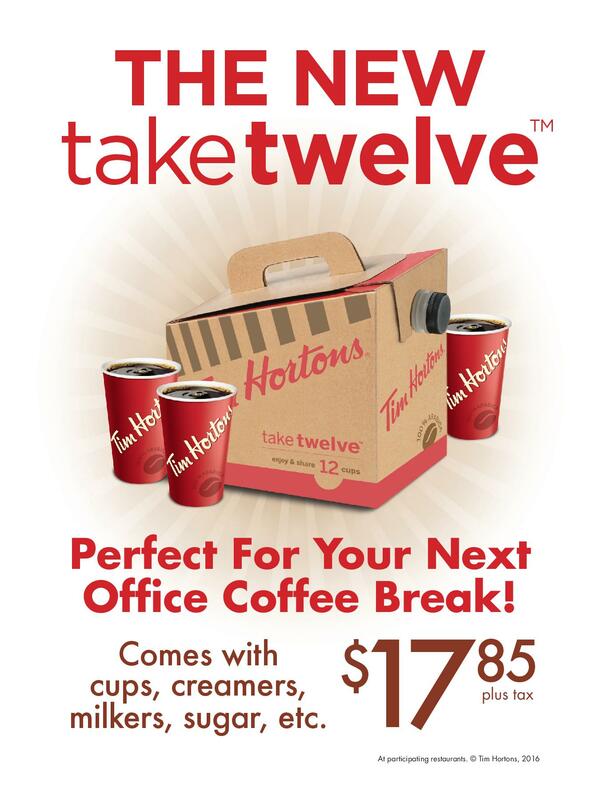 Grab the NEW Take Twelve coffee in a box from Tim Hortons! It's ideal for your last-minute meeting or study session.